"But if Jimmy cracks corn and no one cares, why does he keep doing it?" Last week, Arsenal manager Arsene Wenger commented that throw-ins may be the wrong way to restart play from the sidelines. Wenger argues that the throw-in gives an unfair advantage to teams who feature long throwers, noting that soccer is a game played with the feet. The Arsenal manager somewhat obliquely suggested that eliminating the throw-in would contribute to the purity of the beautiful game. The throw-in is similar to the sideline restart used in rugby. Two hands on the ball, over the head, feet on the ground. In a rugby match, play resumes on the referee’s whistle, which allows both teams to set up. This also gives the referee control over the placement of the restart, something lacking in soccer’s throw-in rule. Often we see soccer players (ahem, Patrice Evra) move upwards of ten yards forward from the spot that the ball left play. 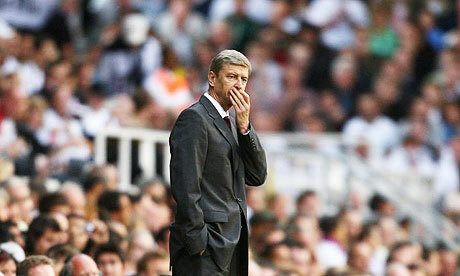 Wenger’s complaint is that players uniquely gifted with strong arms should not be rewarded in a game played with the feet. He envisions a game in which the goalkeeper is the only player allowed to use his hands. The Arsenal manager’s solution? The kick-in. Familiar to indoor soccer players, the kick-in would elevate the importance of possession and accurate passing. A poor pass in the offensive zone becomes a free clearance and poor play in the defensive area can lead to the equivalent of a corner kick up the line. There is little question that a kick-in would improve the purity of the game, as seen from the perspective of a sport played without the hands and arms. But soccer is also a game that rewards possession, and a kick-in rule would make soccer less of a team game. The ability to put the ball in the box from any restart could all but eliminate the middle third of the pitch from a manager’s plans. If your team does not have the most skill, simply load it with height and play for a kick-in. The kick-in also detracts from the game by making a ball out of play essentially equal to a foul. Good defending often results in a throw-in for the offensive player; bad defending results in a foul and subsequent free kick. How often does a poor tackle in the final third result in an announcer’s anxious call: “Free kick from a dangerous position!” A kick-in rule dictates that a defender who forces a ball out of play is subject to the same penalty as one who fouls the attacker. As a defender who has often followed the dictum, When In Doubt Kick It Out, I do not believe a corner kick up the line is a just result for good defending. What do you PSPers think? Is the throw-in a good rule? Should it be modified? What about kick-ins that could only go square or backwards? Would that meet Mr. Wenger’s call for purity while imposing needed limits on the new restart technique? the kick in rule is interesting…limiting the height to which a ball can be played would be ‘fair’, but tough to institute. 2. in the defending zone, any clearance is permissible. Seems to me this is another case of Wenger being a whinging prat again, something we usually only get to enjoy after Arsenal loses (much as is often the case with Ferguson after Man Utd loses). What, beating Villa 3-0 wasn’t emphatic enough a victory for him? Or is he simply trying to distract attention from his decision to substitute in the already injured Fabregas ten minutes into the second half when the match was still coreless? The cost of Fabregas sparking an Arsenal victory was Fabregas having to be substituted himself as he limped off the field after further aggravating the injury that prevented him from starting, an injury that could see him sidelined for three weeks? But to the question of throw-ins, what is bizarre to me is that players do not train more to perfect the art of the long throw-in. For surely, it is not an aberrant skill available only to those with freakishly long arms or some other kind of “unique gift.” Unless, by “unique gift” Wenger means a player who has trained to develop the upper body strength and technique required to throw the ball long. Strong arms, like strong legs, develop with training. The same is true for ball skills, whether they involve the feet or hands. We are all familiar with seeing players pick up the ball after it’s gone out and then make as if to throw it in, only to hand it off to someone else. As is also typically the case with corners, free kicks or penalty kicks, there are usually a handful (no pun intended) of players on a team who regularly take throw-ins. Why should it be anymore difficult for team to have a throw-in specialist, as is the case with Rory Delap at Stoke City? What was so startling about Stoke last season was that Delap’s throw-ins created so much confusion for defenders – why was his throw-in that much more difficult to defend against compared to a free kick taken from a similar spot? The simple answer is that managers hadn’t prepared their players to do so. As for the problem of players moving the ball ridiculous distances from the point where the ball went out of touch, how about the referees simply do a better job of enforcing where a throw-in can be taken from? In the end, Wenger’s suggestion seems to me to be an acknowledgment of tactical weakness for Arsenal, not a problem with the purity of the game or a question of unfair advantage. Rather than change the rules, maybe Wenger should improve his training methods when it comes to throw-ins or simply acquire a player who has already done that hard work on his own. Leave the kick-in indoors where it belongs. Wow, Ed, Wenger seems to have touched a nerve. Were you not allowed to take throws as a child, due to your freakishly stubby and stunted arms? Did the other kids make fun of you for your weak shoulders? I kid, but seriously, are you a Villa fan or something? As an Arsenal and Wenger fan, I am apt to agree with most things Wenger says (aside from his post-loss whining, which as Ed so ably points out, is often baseless), but after considering it, I also think kick-ins are not a good idea. I doubt, actually, that Wenger wants kick-ins in order to correct a deficiency in the Arsenal team, as kick-ins would give them more high balls into the box to deal with, which has been a Wenger-era failing since the beginning (or at least since his inherited defense retired, and certainly in the last five years). If anything, kick-ins would allow _all_ teams to attack the box like Rory Delap. That said, I think adding kick-ins would unnecessarily complicate a wonderfully simple game and, like Ed said, transform every relatively benign change of possession into a deadly set play. Why privilege offense so much? But back to the much more important issue of subbing in Fabregas only for him to re-injure himself–it won the game, and Cesc was pure excellence doing it. Do I want to lose him? No. Was it worth it? Most definitely. That was an absolutely world class performance by him: 28 minutes, 2 goals of the utmost quality, and only 4 points behind the leaders with a game in hand. Not a bad cameo, and we can beat Pompey and West Ham in the FA Cup without him. Yes, I was allowed to take throw-ins, though they were no doubt short because I generally sucked. That said, I can remember next to no coaching dealing with throw-ins. Of course, I played my club soccer in the late 70s-early 80s when the basic qualification for coaching soccer in this country was enthusiasm rather than knowledge or experience. Why the tactical possibilities of throw-ins haven’t been better explored by proper coaches coaching proper players remains a mystery to me. Was putting Fabregas in worth it? Of course it was, though I should think Wenger is more concerned about upcoming league matches than FA Cup ties. Wenger has somewhat defensively been justifying his decision to sub in Fabregas in the British press so the question of doing so is certainly on his mind. I think Wenger is one of the best managers in English football – he has creatively and shrewdly managed Arsenal for 13 years – and Arsenal is the Big Four team I most enjoy watching. But Wenger has increasingly become shrill, ungracious and bitter in defeat and that is very ugly to witness. I can only imagine that it is probably even harder to watch for Arsenal supporters. I am a Reading supporter, though Villa is the Premiership team I have most enjoyed following since Reading was relegated. What’s not to like? Villa are a largely British, though comparatively small, squad with a comparatively small budget, on which are several young players who likely represent the future of the attacking game for England, organized by a former manager of Celtic (whom I also support thanks to personal ties with Glasgow), and are owned by an American who knows enough to stay out of the way. They warm my soppy and sentimental heart. Anyway, thanks for posting Jeremy – I’ve read previous posts of yours and always make sure to read what you have to say. Until the next time . . .
Ah, Ed, no hard feelings, certainly. What better sign for a new, growing site than debate in the comments? 🙂 And you’re right about Wenger, both the good and the bad. I think he’s the finest attacking mind working in the world today, outside perhaps the collective genius that walks on the field every time Barcelona plays, but it’s obvious he’s been severely strained by dealing with the constant press inquiries and second-guessing that have gone with the recent trophy drought, considering the great success it followed. When he wins, I think he’s quite gracious, and there are times when he could be harsher, both with the press and his own players, which I would applaud, but in defeat and in defense of his decisions, good and bad, he has become more and more caustic and even out-of-touch. I don’t believe he honestly thinks Drogba did “nothing” when Chelsea throttled us a few weeks ago, but that’s what he said. Embarrassing. I hope that winning something–anything–will allow him to feel vindicated and thus step back emotionally a little bit. Not too much, but just enough to not feel personally slighted by every question. As to Aston Villa, I quite like them as long as they aren’t playing Arsenal (though their fans sang some pretty classless Heather-Mills-related legless songs after Eduardo returned from his injury). They’ve been especially good recently, and I do hope the loss against Arsenal doesn’t derail them too much. They need to help Agbonlahor a bit more than they do. It’s been better with Milner inside, but Gaby is still too isolated sometimes. And who knew Randy Lerner owned them? Nobody complains when a Yank owns a team so long as he does it well! Agreed Jeremy – it’s like a bar discussion without all the facial expressions and laughing! And the beer.